Big Tree Weekend is coming back to Stanley Park for the third year running, and there is no better way to celebrate the largest trees in our region – perhaps even in the whole province! Surviving the logging history, fire, and major windstorms in the Park, these champions continue to stand sentinel over sections of old-growth stands. Many exhibit deformities or characteristics that make them excellent wildlife trees, enhancing the biodiversity of such areas. Bald eagles, owls, bats, flying squirrels, and many more may be observed in or around these generous giants. 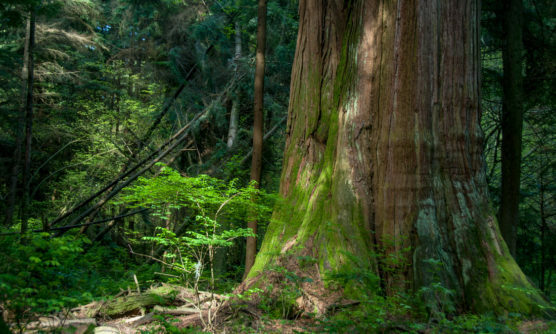 Many of our province’s biggest trees are found right in Stanley Park, just a walk from downtown Vancouver! Join a tour around some of the Park’s giants while learning about the few remaining old growth forests in our province and what you can do to support them. Join Ancient Forest Alliance volunteer educators for an easy ecology walk delivered in Mandarin to see the biggest trees in Vancouver. Learn about the plants, mushrooms, wildlife, ecology, and the status surrounding British Columbia’s old-growth forests. Hosted by the Ancient Forest Alliance (AFA) and the Stanley Park Ecology Society. Click here for more information. Meet at the Stanley Park Dining Pavilion. Explore the secret world of Stanley Park’s tree canopy and the wildlife that call it home. Although we cannot usually see into this unique habitat, we can use our other senses to gain access to this hidden ecosystem. Join us for a hike through the forest as we fill our ears with the “music” of the trees. You will learn to recognize some of the language and sounds of the diverse animal wildlife living in the canopy above us. Meet at the Hollow Tree parking lot. Matthew Beatty with Bartlett Tree Experts and a team of Canopy Technicians, will be making their third annual ascent of some of the biggest trees in Stanley Park. We invite you to climb the trees with them—by camera!—to investigate the ecological systems sustained in their canopies. Using rope and ecologically sensitive climbing techniques, Matthew will explore and expose the importance of the biologically rich and stable micro-environments of these big trees. Find us on Tatlow Walk, between Bridle Path and Lover’s Walk. Check out all of the fun from past Big Tree Weekends. Presented in collaboration with The Big Tree Registry, Bartlett Tree Experts and the Vancouver Park Board’s Tree Week.